The four children of former president Maumoon Abdul Gayoom. (L-R) Dhunya, Faris, Yumna and Ghassan. The four children of former President Maumoon Abdul Gayoom paid off their debt to Rasheed Carpentry and Construction (RCC) on Monday. 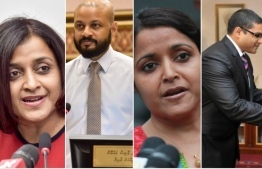 In 2017, the Civil Court ordered the four siblings, Ahmed Faris Maumoon, Ghassan Maumoon, Yumna Maumoon and Dunya Maumoon, to settle MVR 2.1 million owed to RCC for the development of a property registered in their names. A confidant of the Gayoom family stated that the payments had been paid in full as per the High Court's order. The sibling's appeal of the Civil Court's verdict was rejected by the High Court last week. While Ghassan Maumoon appealed to the High Court on behalf of the siblings, the bid was rejected over the failure of Ghassan’s representative to attend the court hearings. Despite the rejection of the appeal, the case can be resubmitted within the following 15 days, as per regulations pertaining to appellants' failure to attend hearings. Ghassan and Faris have announced plans to contest for parliament in April. Although the constitution bars candidates from running in parliamentary elections while debt has been proven against them, some lawyers have stated that the siblings can still contest since the appeal process has not yet concluded.